Picking a final starting forward for my World Cup All-Time Best XI was very difficult. There were so many legends left to choose from. But, in the end, I have to go with the tournament’s all-time leading scorer, Ronaldo. While his fitness (make that fatness) was questioned at the 2006 World Cup, his performances in 1998 and 2002 make him worthy. Ronaldo was actually on the 1994 squad that won the title too, but he didn’t play much. In 1998 though, he scored three goals (a feat he would match in 2006 despite his largesse) and helped lead the team to the Final. Unfortunately, he suffered a seizure the night before the Final and it clearly affected his performance as Brazil finished second. Ronaldo’s most legendary World Cup was the 2002 tournament during which he scored an inconceivable 12 goals. 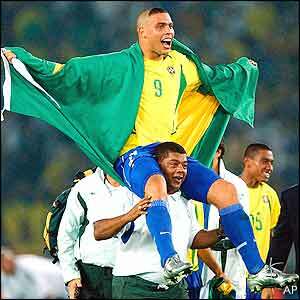 In fact, Ronaldo scored a goal in all but one of Brazil’s matches, ensuring he would receive the Golden Boot. In the Final, he scored two goals to lead the team to a 2-0 victory and ensure Brazil would hoist the trophy for the 5th time. Pele may be “The King”, but Ronaldo’s performance in 2002 certainly earned him his own moniker, “The Phenomenon”. He’s won two World Cups and he is the tournament’s most prolific scorer, so I think he belongs on this list. Sure, recent indiscretions have sullied his image, but when it comes strictly to his play, he’s a global legend. I hope you have enjoyed this series on my selections for the World Cup’s All-Time Best XI. If I left a deserving player out (and I left many out), let me hear about it in the comments. Until then, please keep coming back to SATO for the best news, commentary and analysis on the interwebs. Peace.